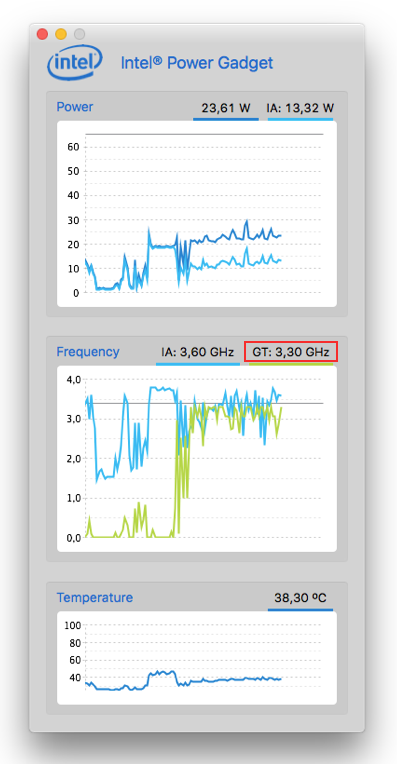 Note: The 3.3GHz should have been 1.1GHz. Thank you Patrick. And I have good news, because I can confirm that the latest version of the Intel® Power Gadget works with my Skylake processor (Intel® i7-6700) and his comment also made me aware of a problem in AppleIntelInfo.kext. Thanks for that. Already fixed and thus the new source code is now available for download. The output is backwards compatible with previous Intel® processors. Meaning that you should read the output as: 23 * 50 MHz = 1150MHz (for example). Which happens to represent the maximum frequency of the IGPU in my Intel i7-6700, so this output is now correct. I still wonder, though, why I see values below 350MHz (7 * 50). Update: The source code of AppleIntelInfo.kext (version 1.5) is now available for download. This update will properly select Skylake processors, but we appear to have some issue with regards to the graphics configuration register output (they are all 0xffffffff) and that is not good. This may be due to SIP settings/changes, or we may have some error in the MMIO read function. Please test this for me, and if you can help me to fix this, then that would be great (swamped with other work already). Thanks! Edit: It appears that the output is fine on Haswell based setups with El Capitan so this is something that came with the introduction of Skylake processors. The IOBAR is also enabled so that is not the problem. Especially the last two data sets, but there is a third one with the same device-id. All three new and added to support processors with the Intel® Iris™ Pro Graphics 580 backed in. The most powerful Intel graphics ever. Credit and thanks to doix for this update (see comments)! That is not good. The first three and last three values should not be there so the next thing that I did was to check the output of the Intel Power Gadget. Not that the Cinebench score changes, because it didn’t, but just so that you know what to look for when it happens on your setup. That may put the Geekbench score the one that was found a few months ago, in a new light. I mean. That board-id (Mac-50619A408DB004DA) is still unused so who else – than Apple – would want to use this kind of data? Intel? Note: You may not see the above error without the ioppf=0xfff boot flag! Update: I should have made it clear that the AppleIntelSKLGraphicsFramebuffer.kext checks for “IMEI” so this is meant for people with Skylake based hardware! And that means that the yet to be released MacBook will be the first Mac with support for Intel HardWare-controlled Performance states (HWP is set to on with 01 00 00 00). There are a lot of news articles written about the case of the FBI against Apple, and I personally think that law enforcement agencies should get access to devices and data, after a judge decides that it is necessary, on iDevices of suspects that are somehow involved with terrorism. Like todays attacks in Brussels. I cannot believe that Apple won’t setup a lab for this and use hardware to get access to locked iDevices, when ordered by law. Is it just me or what? But… someone (cellebrite.com apparently) already found a new attack vector. Hmm. I wonder who that is and what he did. Perhaps he took out the SIM slot and used a specially crafted SIM card, or used the port at the bottom of the iPhone. Two possible attack vectors. I mean. We all know that iOS has (security related) flaws. Otherwise Jailbreak software would not have been possible. So yeah. I’m all in for Apple, or some independent organisation, getting access, with a hardware device that won’t be shared with anyone else. I mean. Who gives a BEEP about my stupid pictures and conversations. My bank info? Same story. Law enforcement agencies worldwide already have access to it so whatever. I mean. Is your data really more important to you than the safety of you and your family? Really? Well. To me it isn’t. Not in this universe, so go go Feds!!! Sure. It may be questionable if this will help law enforcement agencies to prevent future attacks, but to say no upfront… is IMHO not a smart thing to do. Not something Apple should do. And companies like Samsung, Google. Well. You name it. They should all have some kind of hardware device in a lab to help law enforcement agencies. I’m not saying that it should be simple and free of charge, but a reasonable price should be acceptable. And I personally have absolutely zero issues with a solution like this. The Ransomware in the Transmission v2.90 DMG found by Unit 42 certainly proves one thing, and that is that Gatekeeper and SIP in it’s current incarnation, are not good enough. Yes. SIP protects a lot of files, but not all of them. And sure. With Gatekeeper activated it won’t have been installed, but many people – I presume – have changed their Gatekeeper preference so that they can install software from anywhere. Not just the Mac App Store. Some people even disable (parts of) SIP and this particular case shows us that disabling file system protection is not a smart thing to do. Not that it would protect you against this specific malware, but still. Apple should also make it possible to add restrictions, yourself, and perhaps back-port some of the SIP changes it made for OS X 10.12 into the next release of El Capitan so that this is a none issue for future attacks. Please note that the in-app update of Transmission are not affected, suggesting that (some of the) server(s) are/were hacked, or otherwise compromised, and that the developer certificate to sign the version of Transmission that included the malware, was that of a Turkish company (already revoked by Apple). Not the usual certificate from the Transmission developers. I don’t know if the company self was somehow involved, or someone from that company, but their certificate was used by some shady people. And if only Gatekeeper would have checked the (origin) of the certificate, as it should IMHO, and showed you a warning that the certificate had changed, then at least some folks (not all) would have known about this malware long before it was widespread – the DMG with the ransomware was available for quite some time, but since you had to download the DMG yourself, it may be limited. In short. It is time for Apple to act… or perhaps people like Craig Federighi should be careful with comments like: “That’s why my team works so hard to stay ahead.“. I mean. Torrent apps like Transmission won’t get accepted by Apple – for the App Store – so they basically expose people to attacks that could have been avoided. Don’t you agree?